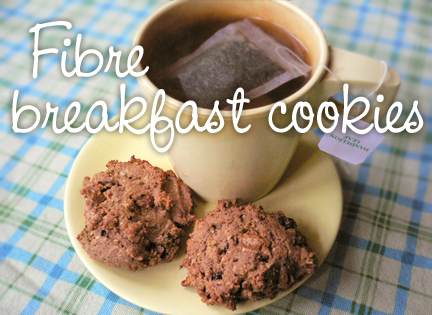 A couple of these cookies in the morning with your tea will give you energy AND keep your bowels happy! Place chopped prunes in a blender and just cover with boiling water. Let soak while you prepare the dry ingredients. Also, lightly oil a large baking sheet and preheat oven to 350. Measure all dry ingredients into a large bowl and mix well. Measure all wet ingredients into the blender with the soaked prunes (do not drain), then liquify and stir into dry ingredients, combining well. Drop batter by the heaping tablespoon onto the greased cookie sheet and flatten just a bit with wet fingers or the back of a wet spoon. Bake for 15 minutes. Make sure you have a glass of water or cup of tea with each cookie. Makes about 20 cookies. This recipe makes the cookies slightly crunchy on the outside. For a softer cookie (recommended for Vatas) double the amount of prune puree and apple sauce. This will make them almost muffin-like. *To make your own prune puree, soak chopped prunes in boiling water (enough to cover the prunes) for 15 minutes or longer. Make in larger quantities to use as a sweetener in baking, or as a spread for toast and quick breads! Use prepared prune puree in this recipe by skipping the part where you soak the chopped prunes in the blender, and instead just add the measured amount of puree into the blender along with the rest of the wet ingredients. PITTAS use whole wheat, spelt or barley flour; sweeten with maple or brown rice syrup; choose almond butter; avoid walnuts, cashews, peanuts, pecans and sesame. KAPHAS use any whole grain flour except oat, rice and wheat; sweeten with fruit juice concentrate or additional prune puree; choose pumpkin or sunflower seed butters; replace half or all the psyllium with more ground flax; use dried fruits and/or pumpkin or sunflower seeds. I'm so glad I found this! I was sick of spending absurd amounts of money on "healthy" cookies and decided I've got to make my own. I just made these and they are amazing. I added apricots to the mix and a touch of raw honey as a glazing and all I can say is mmmm. hi, same question again here - could i use sesame or sunflower seed pulp, and how would i adjust the recipe to make it work? thank you! Glad to hear it, Janira! Olivia, I'm sorry I don't have any idea about using seed pulp. Perhaps try adding it as simply a supplement within the recipe -- ie. stir in 1/4 cup or 1/2 cup into the batter?